Almost all schools in Kerala reopened on August 29 after an unusually long Onam vacation. A good number of the students had faced the flood firsthand, and adding to their woes was the fact that their textbooks and notebooks were lost. But, they need not have worried. The government offered them new textbooks. And, unknown friends across the state, and even Malayalis from other states, had copied down the notes for them. Such notes of positivity play a big part in boosting the morale of those devastated by the deluge. But there is a long way to go. The Public Works Department estimated that road repair would cost Rs 5,815.25 crore and would take 18 months. Official figures put the number of deaths at 322, despite the brilliant rescue operations, and Chief Minister Pinarayi Vijayan has said that the total loss is likely to be much higher than the initial estimate of Rs 20,000 crore. The state government declared emergency aid of Rs 10,000 to the people affected by floods and Rs 10 lakh to those whose livelihoods were lost. Interest-free loans of up to Rs 10 lakh for small traders who had suffered losses and home loans of up to Rs 5 lakh, without margin money, were also announced. A state-level bankers’ council met on August 29 to discuss moratorium on loans for the affected people. The local self-government department (LSGD) estimated that about 5.78 lakh houses were affected. More than 50,000 were washed away or had become uninhabitable. The Kerala government handed over Rs 330 crore from the State Disaster Response Fund (SDRF) to the districts. Of this, Rs 99 crore was emergency aid to repair houses. The government also announced Rs 4 lakh for families who had lost their homes and Rs 10 lakh for those who lost homes and lands, citing the Central norm (Rs 95,100 for a destroyed home) as inadequate. 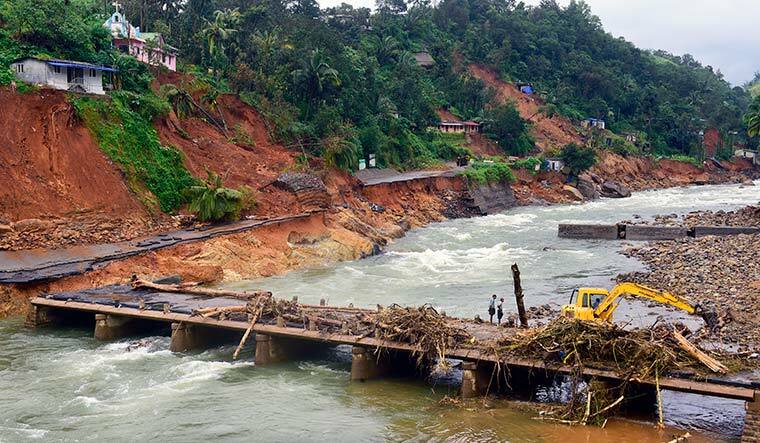 The flood also took a heavy toll on Kerala’s intricate road network. It is estimated that 80,000km of roads were lost or damaged, and 218 bridges were damaged, of which 40 collapsed. The Public Works Department (PWD) estimated that repair would cost Rs 5,815.25 crore and would take 18 months. Small roads and state highways alone would cost Rs 4,978.08 crore, national highways Rs 533.78 crore, bridges Rs 293.3 crore and government buildings Rs 10.09 crore. The department has already spent Rs 5 crore to clean the slush on roads, and Rs 18 crore to remove rock and silt deposits at 25 places. The department now needs Rs 368 crore to level potholes and it plans to spend Rs 196 crore to build drainages. Agricultural loss in 56,439.19 hectares amounts to more than Rs 1,345 crore. The 3.09 lakh affected farmers would be given Rs 233.84 crore as aid. The loss of 25,370.59 hectares of paddy (worth about Rs 381 crore) means that Kerala would need to depend on other states for rice—its staple diet—even more than it does now. The state needs about 40 lakh tonnes of rice every year. The health department had issued advisories in a bid to control flood-triggered diseases such as leptospirosis and provided guidelines to local authorities for disinfecting areas that were flooded and cleaning drinking water sources. The guidelines also pointed out that flood-affected people were likely to suffer psychological problems and advised necessary steps. Health Minister K.K. Shailaja said that flood-affected people would get medicines free for one month. The economic burden on the state was made worse because one of its mainstays—the tourism industry—suffered losses to the tune of Rs 2,000 crore (Rs 1,500 crore opportunity loss and Rs 500 crore property damage). The Cochin International Airport, which was forced to suspend services, suffered an estimated loss of Rs 300 crore. While finding money for rebuilding will be a herculean task (thanks in part to the Centre’s apparent apathy), early signs have been positive. From children who broke their piggy banks to donate to the Chief Minister’s Distress Relief Fund to the hundreds, led by the state ministers, governor and other top government officials, who contributed their one month’s salary, the will to contribute is palpable. Not to mention, the donations from thousands of individuals and entities worldwide. The government is expecting to raise Rs 1,000 crore plus though the CMDRF. Till date, it has received Rs 718 crore. The state is in the process of fine-tuning many proposals to shore up its revenue. These include a request for exemptions on GST, introduction of an additional cess, and issuing bonds. “Issuing bonds is a good solution, but for that the Union government must allow us some relaxation on the FRBM (Fiscal Responsibility and Budget Management) Act which insists that loan amount should not surpass 3 per cent of the GDP,” R. Ramkumar, member, Kerala State Planning Board told THE WEEK. The state is also trying to avail loans from international financial institutions, and is hoping that the Centre will increase the limit. Even a 0.5 per cent increase would translate to loans of about Rs 6,000 crore. A World Bank team led by its country director visited the state on August 29 and met the chief minister and top bureaucrats. The government hopes to raise Rs 3,000 crore plus from the World Bank. It is learnt that Gita Gopinath (a Harvard professor who has held senior posts at the IMF), financial adviser to the chief minister, will liaise with the World Bank. While the volunteer work was awe-inspiring and the philanthropy heartwarming, the silver lining of the disaster may be a visible change in the approach towards the environment and ecology. The government is preparing to introduce stringent laws to check encroachments and quarrying. The chief minister said that those who throw waste into rivers will be punished. Moreover, a great deal of attention is being paid to waste disposal. The task, especially disposal of electronic waste, will be a major challenge and it has been assigned to the LSGD. Every panchayat will have separate dumping yards for degradable and non-degradable waste and there will be a state-level body to coordinate. “Our gram panchayats have done exemplary work during rescue operations and they will continue with similar commitment in all future tasks,” said T.K. Jose, LSGD secretary.